A Maltese youth international has signed a two-year professional contract with Peterborough United. Andrea Borg, who chairman Darrah MacAnthony says “plays like Erhun Oztumer”, put pen to paper today (April 13). 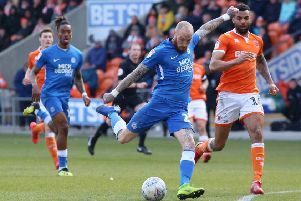 He has already been named on the substitutes’ bench for the Posh first team in recent weeks and is expected to be included in the squad for Good Friday’s clash with Fleetwood Town. Borg, who joined Posh in the summer of 2016, can play in a number of attacking positions and scored his first goal at the ABAX Stadium earlier this week for the reserves in a 5-2 victory over Newport County. Under 18s manager Jack Collison said: “Andrea took a little time to settle, but he was adjusting to life in a new country and that is a big move for a youngster, but since Christmas he has been fantastic.